What Are The Benefits of Using The Hook-Lift (rolloff style) Dumpster System? Unlike the rolloff system used by others, the hook-lift allows us to drop off dumpsters in tighter areas. Some of the dumpster delivery trucks we use to carry our containers are smaller than those used with the track-cable system, allowing us to place containers in tighter spots and on less-sturdy surfaces. With our hook-lift dumpster system we are able to softly place containers on the ground instead of literally dropping them as rolloff trucks do. What this means is that we treat your concrete, asphalt and lawn gentler than they do. Unlike our competition, we offer small 10, 15, 20, and 25 yard dumpster rentals that are perfect for those small jobs in tight spaces. What Can’t I Put In A Dumpster? Liability for appropriate waste remains with the customer as agreed to in the terms and conditions of service. Yes. Standard dumpster rentals have the following weight limits: 10 yard dumpster rentals have a 2 ton weight limit, 15 yard dumpster rentals have a 3 ton weight limit, 20 dumpster rentals have a 4 ton weight limit, and 25 yard dumpster rentals have a 5 ton weight limit. If you are loading heavy material such as dirt, rock, concrete, brick, sod, shingles, or asphalt, please contact Greenway Dumpsters office for instructions on loading. Note – Asphalt Shingles/Roofing Dumpsters: We offer a flat rate dumpster rental with no weight limit for asphalt shingle. Please call for specific dumpster loading instructions. Charge for weight of contents beyond limit specified above: $50/ton. Can I Fill The Dumpster To The Top? All materials must be inside the hook-lift dumpster, nothing over the top of container. By law, we are required to tarp each dumpster for transport. We cannot pick up a container that is over-full. You will be responsible for removing excess and a $75 return trip fee will be charged to return and pick-up the dumpster. The standard dumpster rental period is up to 7 days. Rental periods can be extended for an additional fee. Will The Container Be Picked-Up Automatically? Yes. We will automatically return in 7 days to pick up the container unless you instruct otherwise. Will The Dumpster Damage My Property? We respect your property and make every effort to ensure no damage is caused. Protective barriers are placed between your property and our hook-lift dumpsters to ensure no damage is done. No. We will do our best to place your container in a convenient and safe space, you may not move container. Moving container causes damage to underside. If damage occurs, you are responsible for the cost to correct. Does Greenway Dumpsters Offer Full Service Trash Removal? Yes! 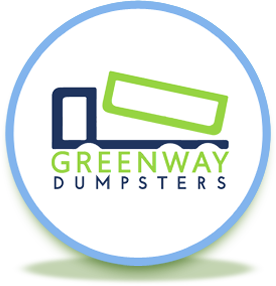 Although it is not heavily advertised, Greenway Dumpsters will be happy to assist our customers with the labor necessary to dispose of your trash in a Greenway Dumpster. We offer junk removal services for your home or business including offices, retail locations, construction sites, and more. Is Your Disposal Operation Environmentally Friendly? Yes! We do our best to protect the environment with our safe and eco-friendly practices, including appropriate disposition of waste materials based on their nature and re-use potential. A cubic yard is 3’x3’x3′ and weighs nearly 1 ton for sand or dirt, but much less for most construction and trash materials. 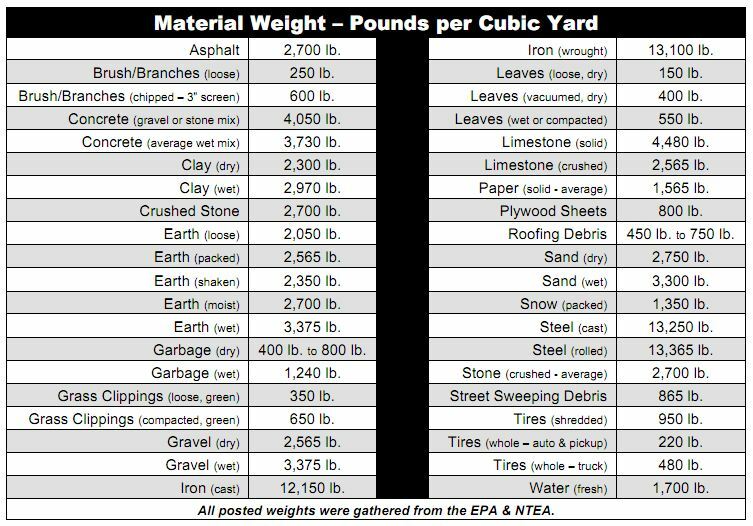 Most personal pick-up trucks carry 2 cubic yards of material. Greenway Dumpsters can help you estimate the size of the hook-lift dumpster or container you will need. How Much Does Trash Weigh? Below is a chart showing the approximate weight of various kinds of typical waste contents. As the renter of the dumpster, you are responsible for the contents of the container and any damage that occurs to our container while on your site. We hope these answer the questions you have, and we are more than happy to help you with your specific needs. To receive more information about Greenway Dumpster services, or a price quote, please call or email us today.